Lily Reeves is fascinated by belief systems, myths, and ritual. Her practice primarily focuses on creating unique spaces within which visitors have mystical experiences. For SHE BENDS: Women in Neon, Lily partnered with fellow artist, Krista Davis, who explores queer tactics in her own work, to create Never Ending in All Directions // On This Page The Map is Undone. Never Ending in All Directions illustrates the mythological story of a wanderer. 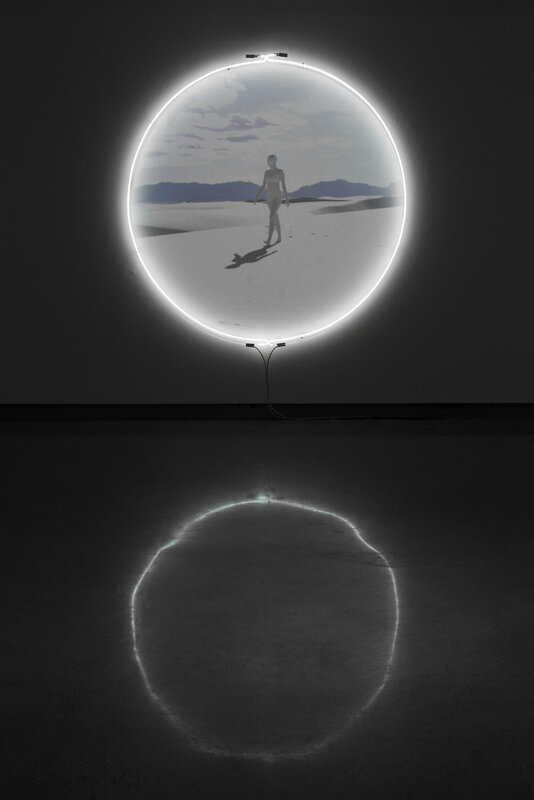 A white neon circle encases a video projection showing a genderless entity walking through an ambiguous terrain. Directionless, the wanderer is engaged in a spiritual plane of self-reflection, introspection, and self-discovery, as they contemplate the unknown direction of their life. To the artist duo, it was important that the wanderer remain sexless, genderless, and ambiguous. At times the figure seems to dissipate into the atmosphere, giving the impression of a mirage. Lily grew up in the South, alongside communities of evangelists and outsider artists, which she credits with her initial interest in belief systems. Educationally, this curiosity led her down a research path into the occult, comparative religion, mythology, global rituals, and the relation between mind-body-space. Lily’s fascination with diverse faith-based practices carries into her art with installations that immerse visitors into shared moments of spiritual transformation by inviting audience members to engage in actions reminiscent of rituals. Reflecting on her interest in spirituality, Lily explains that there appears to be a mass turning away from religious and spiritual concepts which foster concepts like empathy. “If we’re losing those parts of ourselves, what kind of society are we turning into?” she asks. 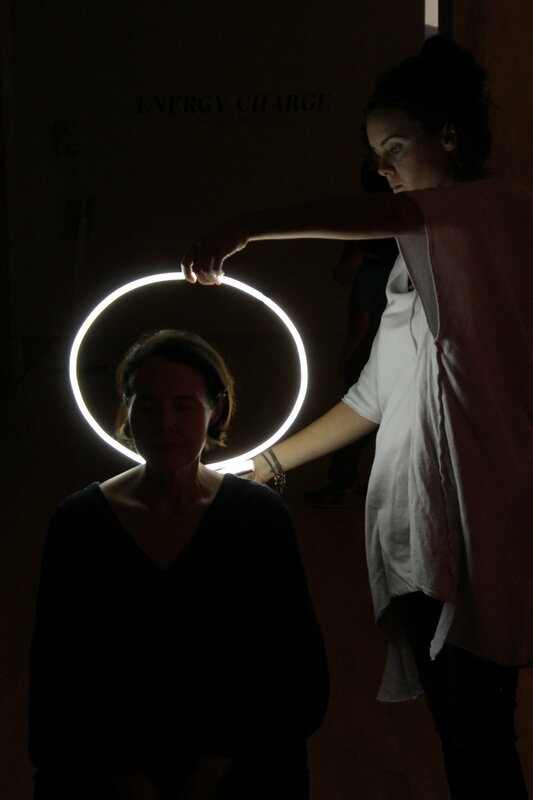 A selection of Lily Montgomery’s work is currently on view at The Midway Gallery as part of SHE BENDS: Women in Neon. Lily will also be curating a number of exhibitions while on retreat with the Takoja Institute in New Mexico this summer; find out more here.